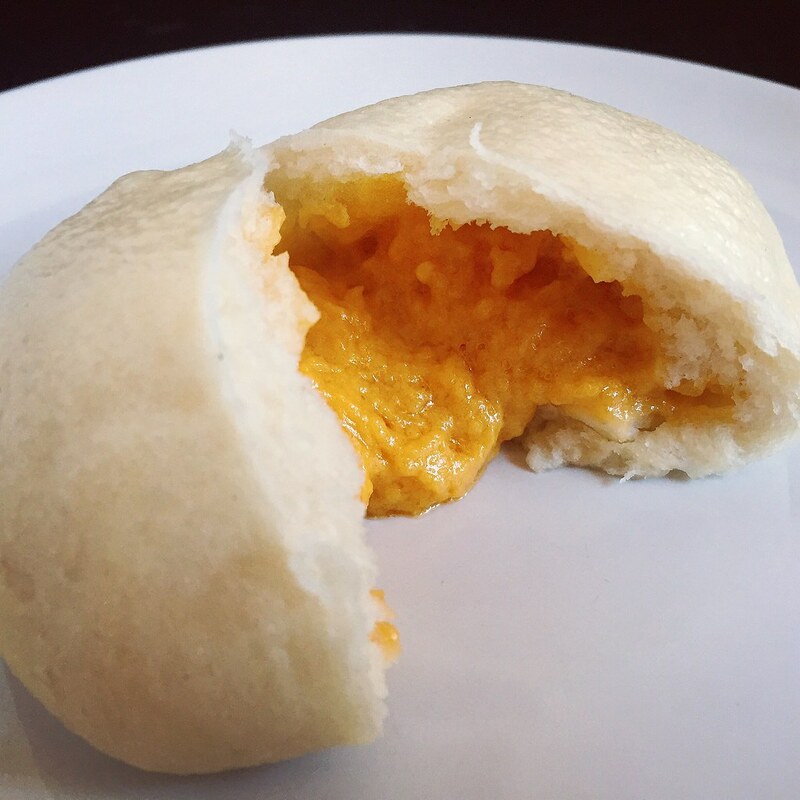 Earlier last year I discovered a new kind of steamed bun, the liu sha bao. I think translated directly it means "quicksand bun" but it's actually a lot better tasting that it sounds. Inside is a molten filling made of salted egg yolk custard, and I could probably eat 5 of them in a row. 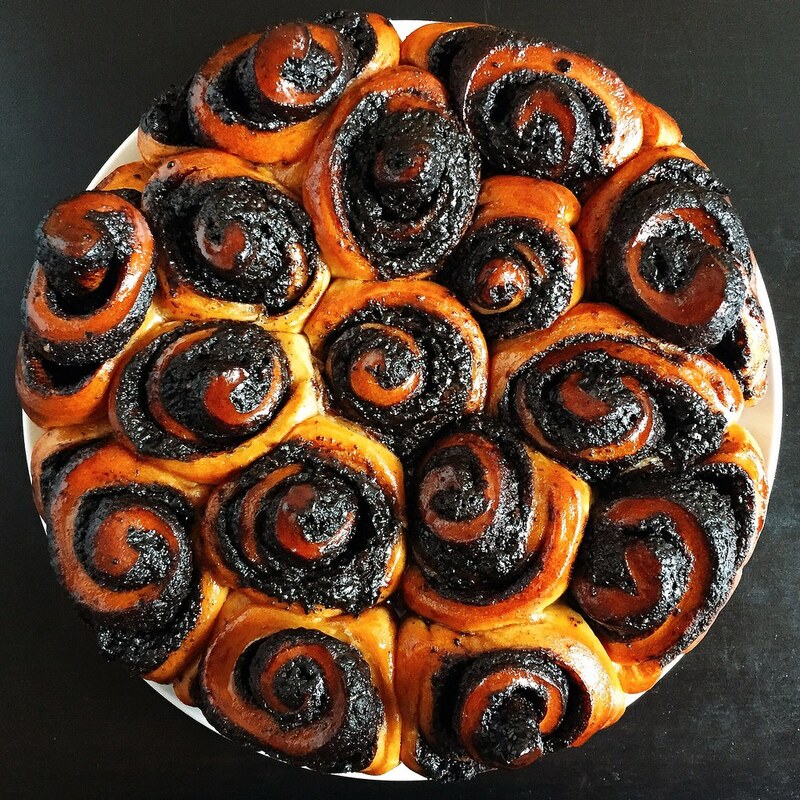 I tried making some a few weeks ago, but the result was just okay and not really worth all the work when I can just get the perfected bun at dim sum. Because of that experiment I still had 3 cooked salted duck eggs sitting in my fridge, though, so I figured I'd try to make an ice cream out of them. 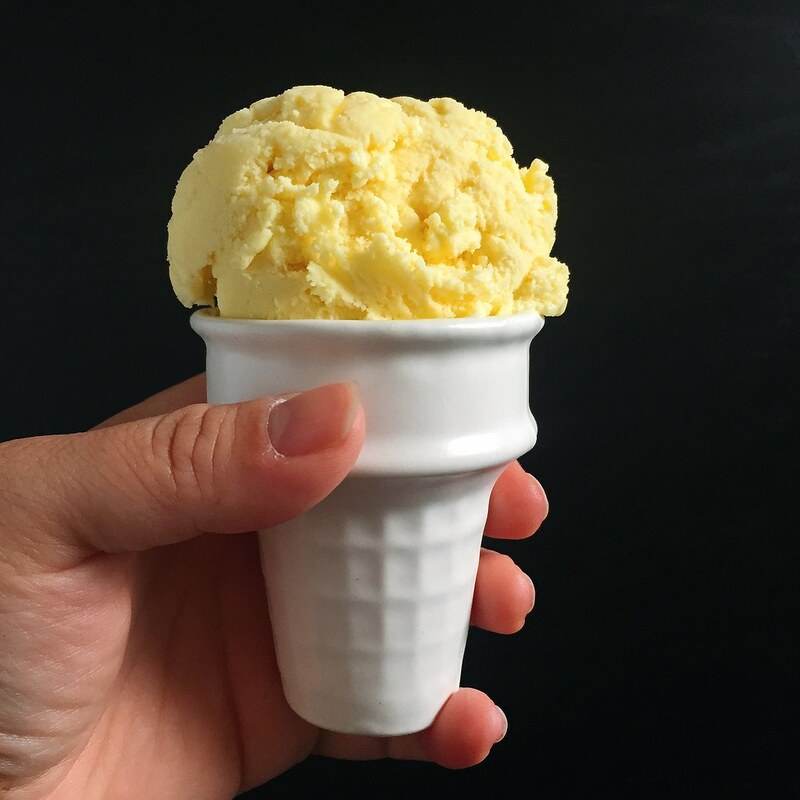 I followed the template of Jeni's Salty Vanilla Frozen Custard, but I replaced 3 of the raw egg yolks with 3 cooked salted duck egg yolks, which you can find in the egg section of a Chinese grocery store. I reduced the salt a little because the egg yolks were already salted and added a little bit of turmeric to increase the yellow coloring of the ice cream. It still comes out a rather pale yellow, but I didn't want to add any artificial food coloring. The resulting ice cream is incredibly rich, and tastes pretty much like the inside of a liu sha bao but in ice cream form. So I decided to try making it into mochi ice cream to continue down that path. 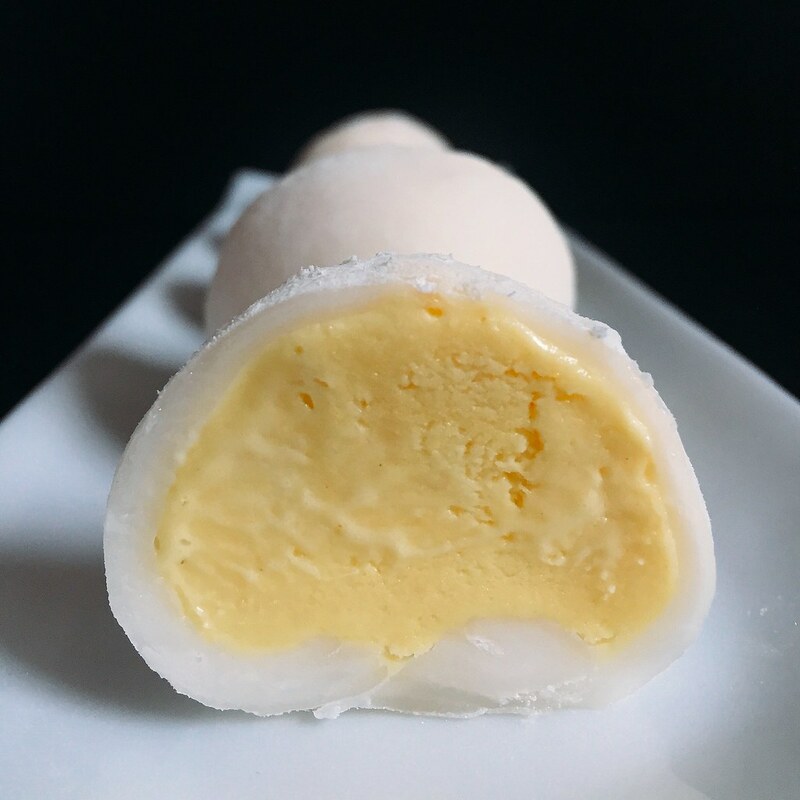 I've tried making mochi ice cream before and that attempt was disastrous, to say the least, so this time I made sure to follow a trusted recipe. I'm happy to say that the one from Just One Cookbook worked marvelously. 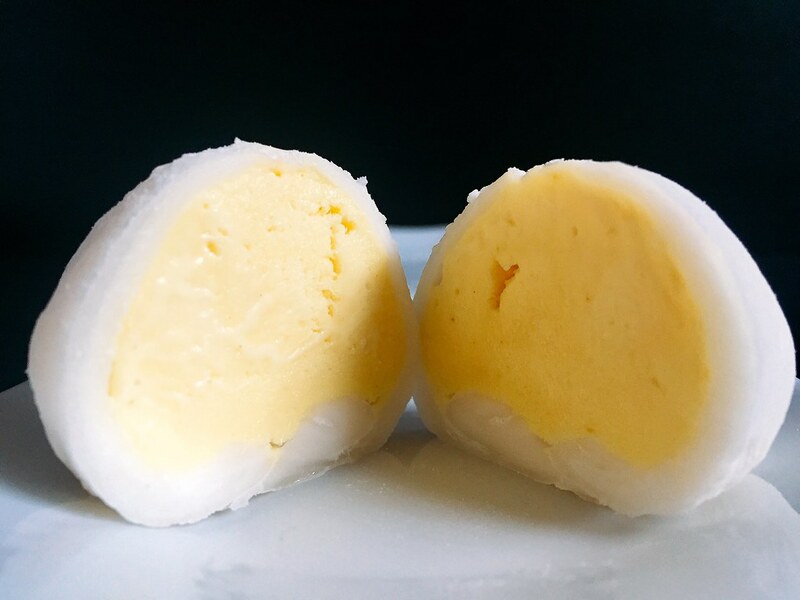 These salted egg yolk mochi ice creams are perfect because you only need a couple of bites of the ice cream, and the soft, chewy mochi helps keep the intense flavor from being too overwhelming. Plus, I think they look super cute and remind me of liu sha bao! Carefully crack and peel the salted duck eggs, removing the whites until you are left with only the egg yolks. Mash the egg yolks in a medium bowl, then add the cream cheese, salt, and turmeric and whisk until smooth. Mix about 2 tablespoons of the milk, the raw egg yolks, and cornstarch in a small bowl and set aside. Fill a large bowl with ice and water. Combine the remaining milk, the cream, sugar, and corn syrup in a 4-quart saucepan, bring to a boil over medium-high heat, and boil for 4 minutes. Remove from the heat and gradually add about 2 cups of the hot milk mixture to the egg yolk mixture, one ladleful at a time, stirring well after each addition. Pour the mixture back into the saucepan and heat over medium heat, stirring constantly with a heatproof spatula, just until the mixture thickens. Remove from the heat and strain through a sieve if necessary. Place a cupcake pan in the freezer to chill. 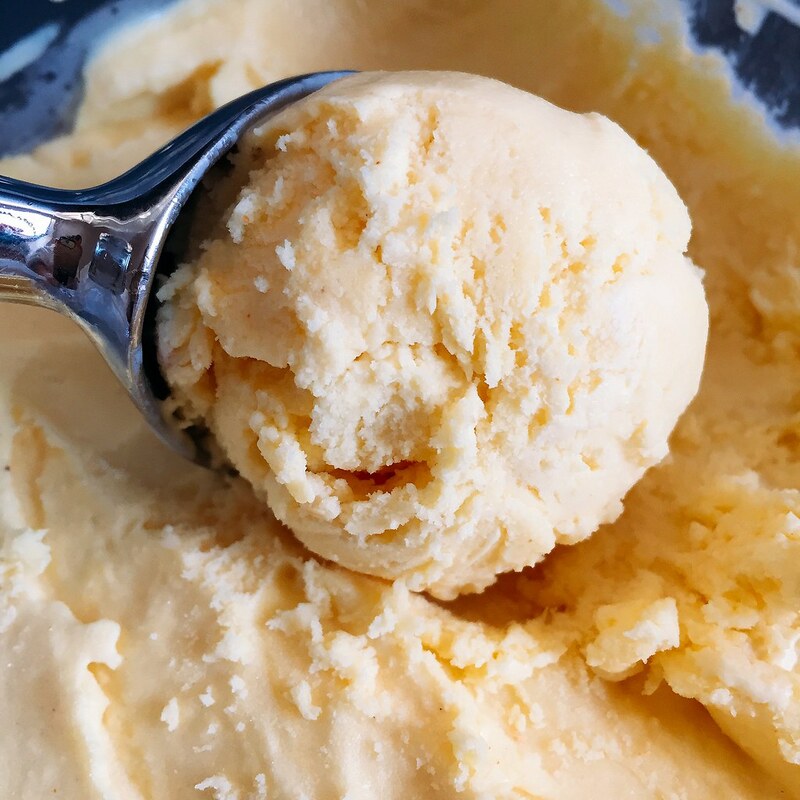 Use a cookie dough scooper to scoop 6-8 balls of ice cream. Place each ball on an aluminum cupcake liner in the cupcake pan and freeze for several hours until hard. Whisk together the glutinous rice flour, sugar, and water in a medium microwaveable bowl. Cover and microwave for 30 seconds. Stir with a wet rubber spatula then microwave for another 30 seconds. Continue to stir and microwave in 30 second increments until the mochi comes together in a slightly translucent, sticky mass. Generously dust a Silpat or parchment paper with cornstarch. Transfer the mochi on top and dust with additional cornstarch. Dust a rolling pin with cornstarch and roll out the mochi into a thin layer, about 1/8". Chill in the refrigerator for 15 minutes. Use a 3 1/2" cookie cutter to cut the mochi into circles. I was able to easily cut out 6 circles, and if you want, you can reroll the scraps to make more circles, just make sure to redust with cornstarch. 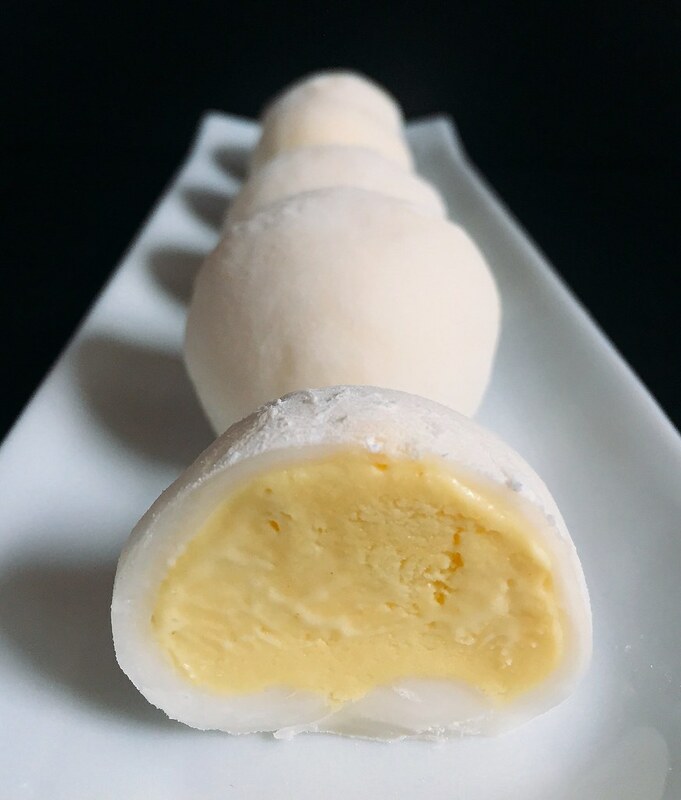 Place one of the scoops of ice cream in the center of a mochi circle. Bring the edges of the mochi up and over the ice cream and seal together, working quickly so that the ice cream doesn't melt. Wrap in plastic wrap and return to the freezer. Repeat with the other scoops of ice cream and mochi circles. When ready to eat, let sit at room temperature for a few minutes so that the mochi can soften. I've posted about overnight waffles before, but I wasn't very impressed with them so I've been making Waffles of Insane Greatness instead whenever I want waffles. Then I discovered this recipe and everything changed. 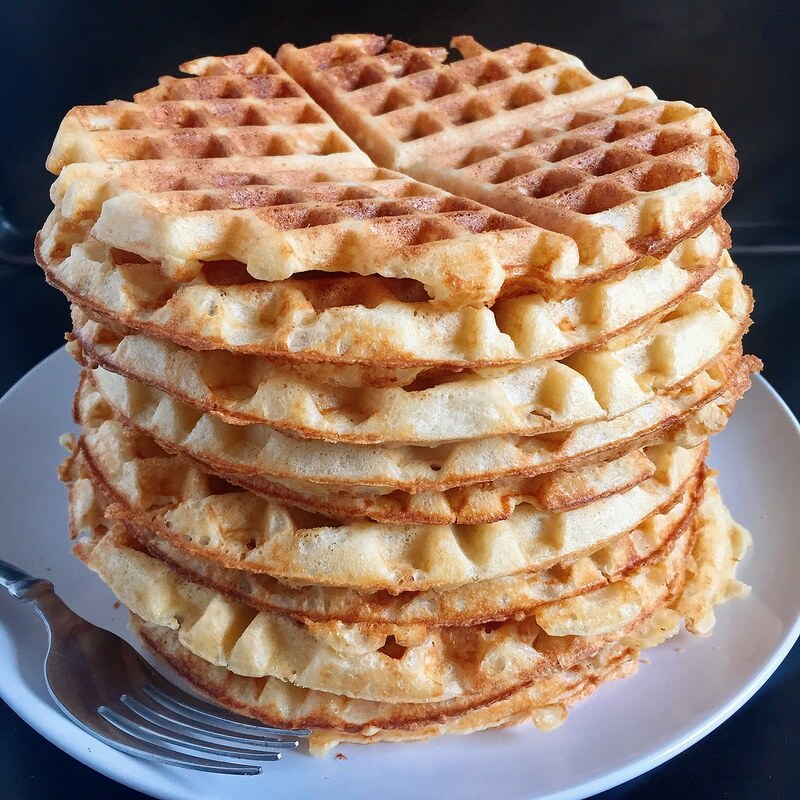 I still love the Waffles of Insane Greatness, especially if I want waffles now and not tomorrow, but the flavor you get from letting the yeasted batter sit overnight is so amazing and complex and worth the wait. Unlike the overnight waffle recipe I tried previously, these waffles stay crispy, especially if you keep them in a warm oven while you make the rest of the batch. They also freeze very well, which is good because the recipe makes quite a lot of waffles. I just pop them in my toaster oven in the morning like an Eggo waffle. The original version of the recipe has you letting the batter sit out overnight on the counter at room temperature. If that freaks you out, you can always let it sit in the refrigerator overnight, but you will lose a little of the flavor. The first time I made these, I read the recipe wrong and added the eggs with everything else so I let it rise in the fridge. The second time I added the eggs after letting it sit out overnight, and both times were pretty great so just do what you feel comfortable with. The recipe also scales up and down pretty well; I've made a half batch when I've only had 1 egg as well as a 6x batch for a ski trip! Sprinkle the yeast over the warm water in a large bowl and let dissolve while you measure the rest of the ingredients. Add the milk, melted butter, salt, sugar, and flour and whisk until combined. Cover and let sit overnight on your counter or in the refrigerator. In the morning, whisk in the eggs and baking soda. 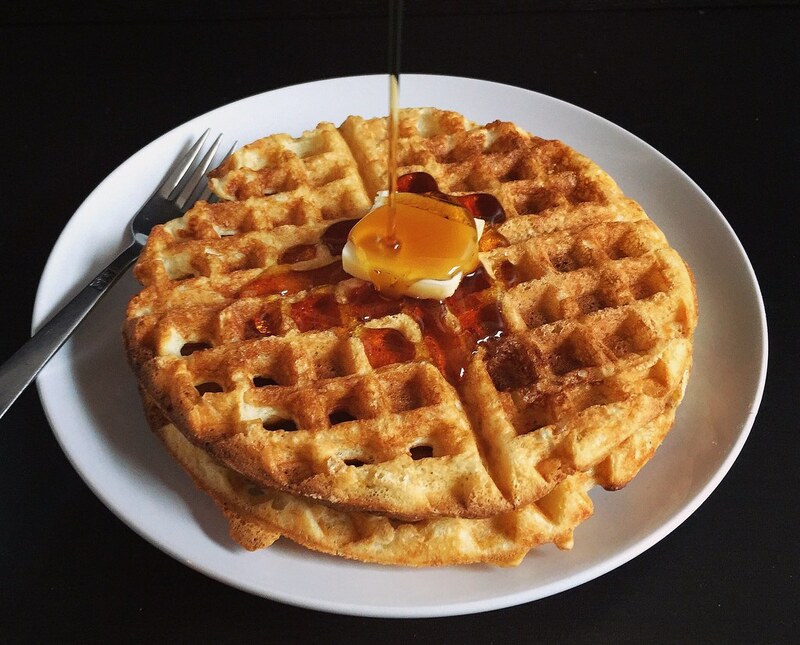 Cook in a waffle iron and serve warm. 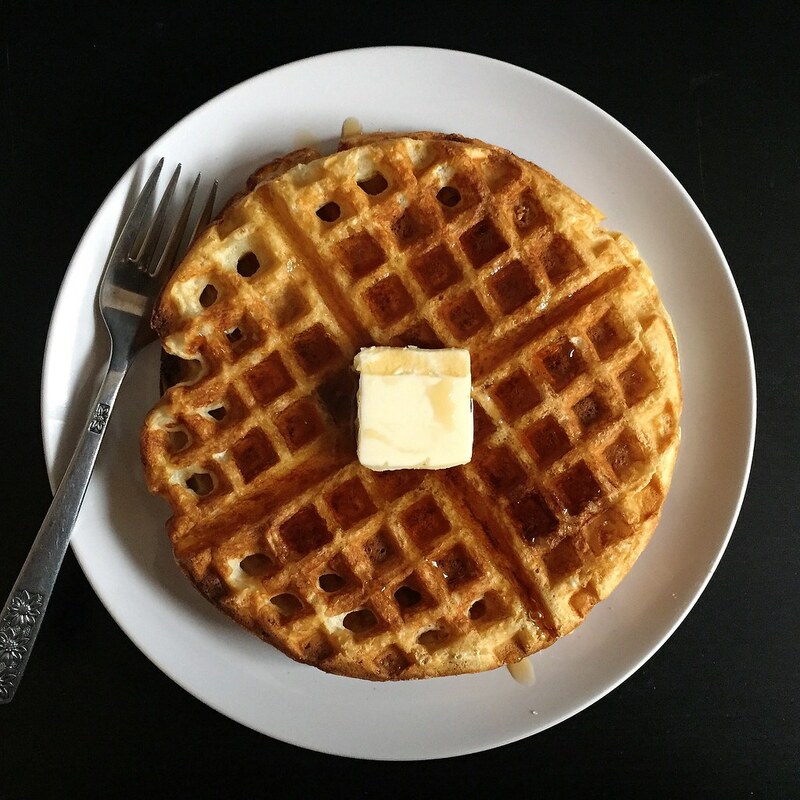 Waffles will freeze well; just reheat in a toaster or toaster oven. 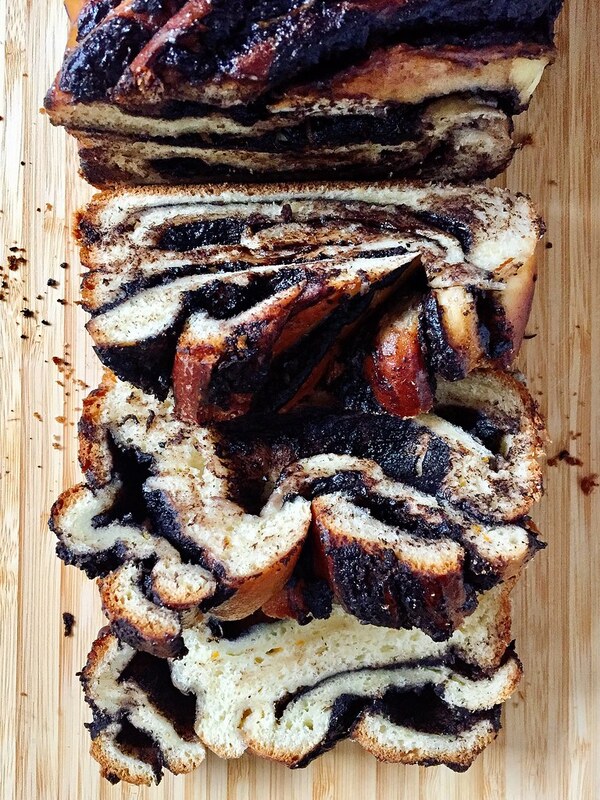 Last year I had the smart idea to try making a matcha babka wreath with milk bread dough. In my head it would be pretty, and green-tinged, and perfect for the holidays. In reality, it was dense, ugly, and I ended up throwing it out. 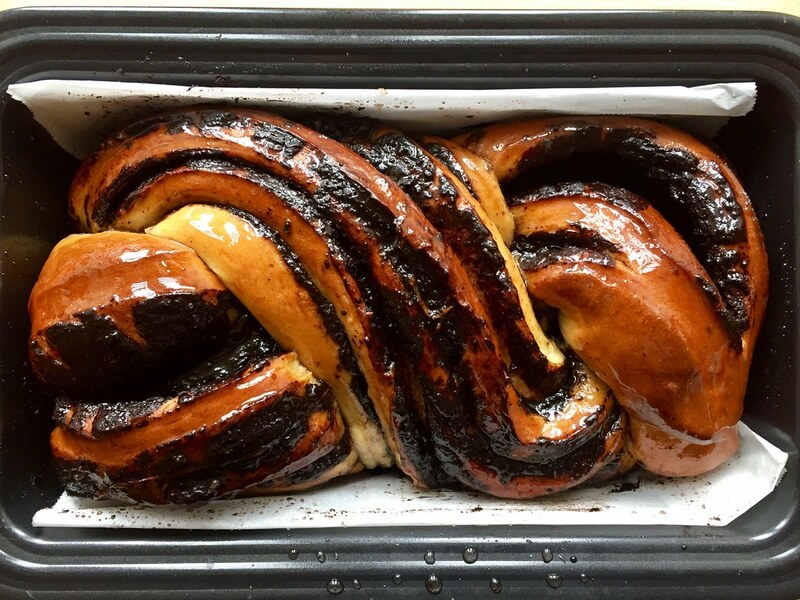 This year I decided to follow this tried-and-true recipe for chocolate babka from Smitten Kitchen. The only change I made to the ingredients is that I used the zest from a whole orange instead of half an orange, and the smells that came out of my oven were glorious. I also tried shaping it using what I remembered from the pictures in the Baking Breads cookbook. 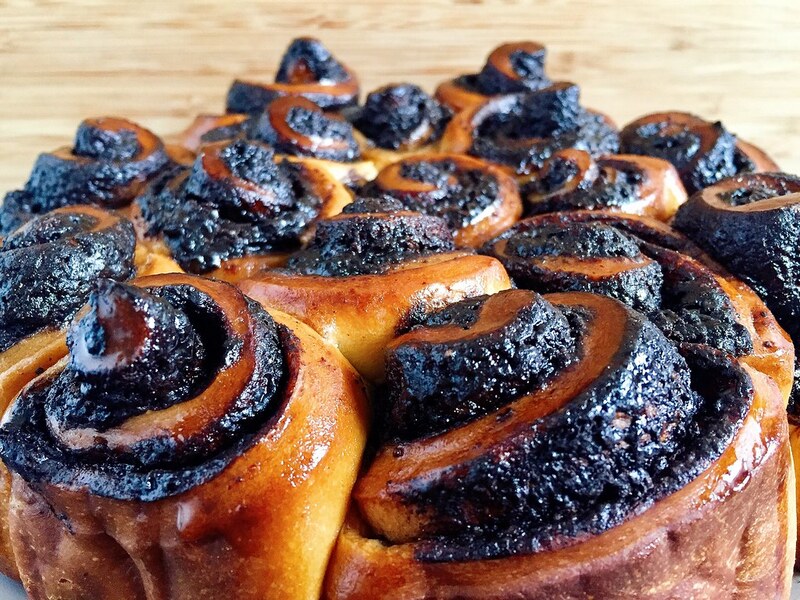 Since the recipe makes two loaves, I decided to give one of the loaves the "pull-apart swirly bread" treatment. If you'd like to try it, roll out a quarter of the dough (half a loaf) into a rectangle about 10" wide and as long as you can get it. Spread with 1/4 of the filling and roll it up along the long edge. Seal the seam and place in the freezer for 15 minutes while you repeat the same with the other quarter of dough. Slice each log into 8 pieces, and arrange all 16 pieces in a well-greased 9" springform or square pan. Let rise for an hour and then bake for 25-30 minutes at 375°F until nicely browned. Brush with syrup and serve. Sprinkle the yeast over the warm water in the bowl of a stand mixer and let sit while you measure out the rest of the ingredients. Add all the ingredients for the dough except the butter and mix with a dough hook until it comes together. Add the butter, one tablespoon at a time, until it is all incorporated. Knead on medium until the dough is completely smooth and comes away from the bowl. Cover and refrigerate overnight. The next morning, make the filling by melting the chocolate chips and butter together, stirring until smooth. Add the powdered sugar, cocoa powder, and cinnamon and stir until it forms a spreadable paste. Grease 2 loaf pans and line with parchment paper. Remove half the dough from the refrigerator and roll out on a floured surface until 10" wide on the bottom and as long as you can get it. Spread the filling on top, leaving an inch border on all sides except the bottom. 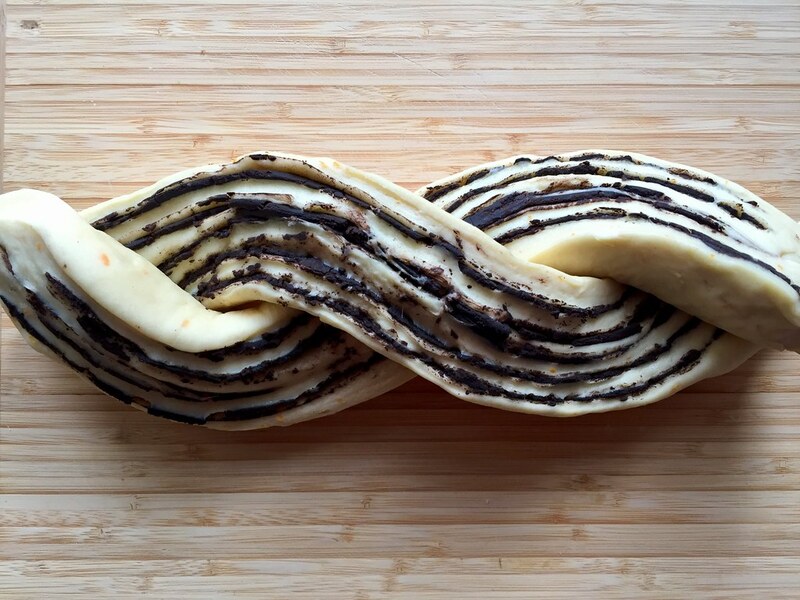 Roll up the dough in a tight spiral starting from the bottom. Wet the top edge and seal together. Wrap with aluminum foil and place in the freezer while you work on the second half of the dough. 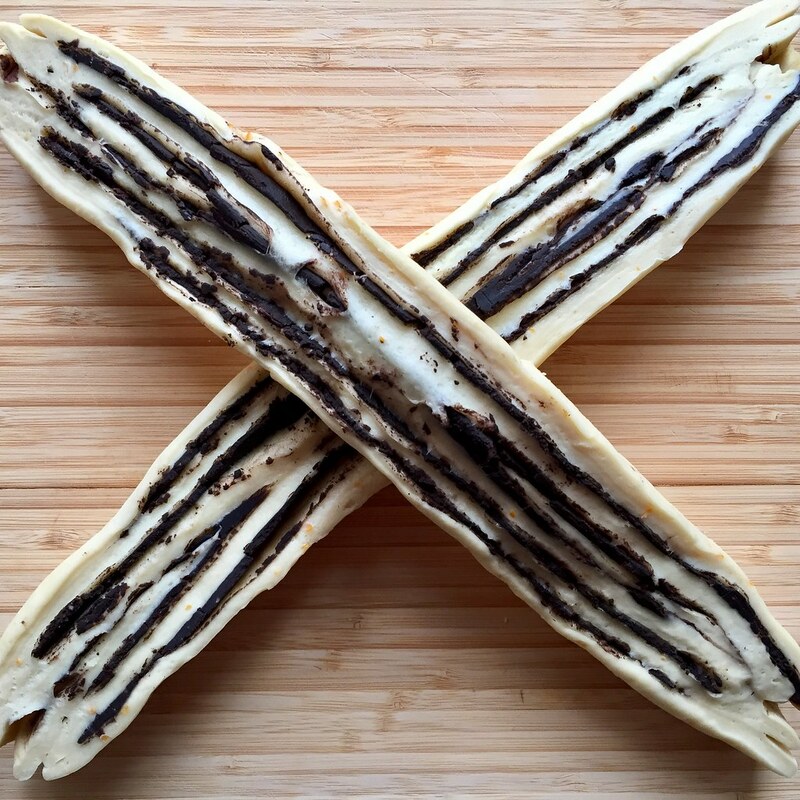 Remove the first log from the freezer and use a sharp knife to slice in half, lengthwise, revealing all the layers of dough and chocolate filling. Make an "X" with the two halves, placing the prettier half on top. Twist the top half and bottom half and place in one of the greased pans, tucking the ends underneath. Repeat with the second half. Cover both and let rise another hour. Preheat oven to 375°F. Bake loaves for 25-30 minutes, until a skewer meets no resistance when inserted and comes out without any dough (it will most likely come out with some chocolate filling which is very tempting to lick). 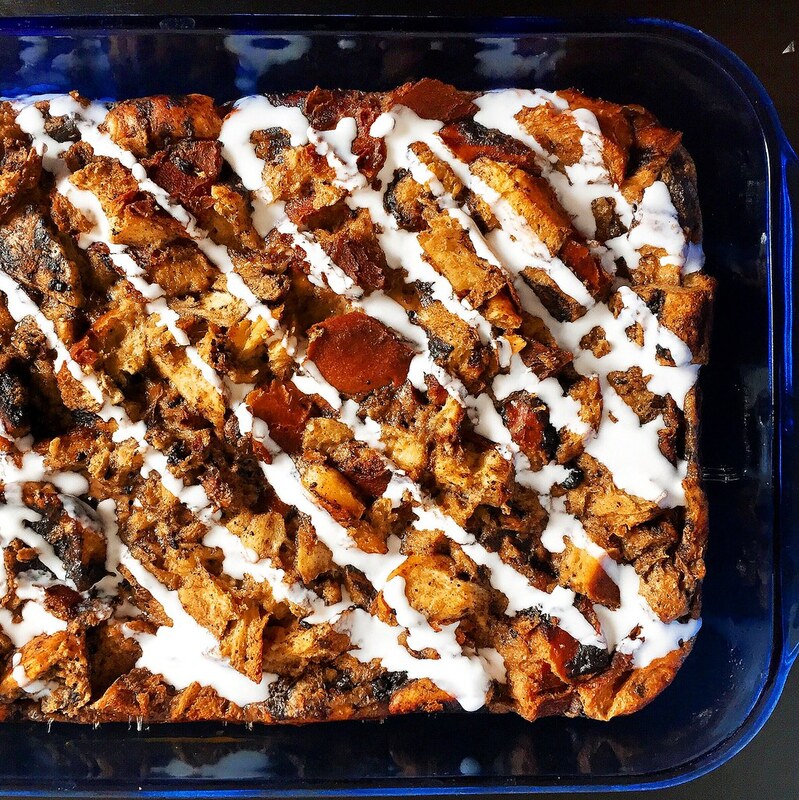 While the babka is baking, make the syrup by combining the water and sugar in a small pot and heating until the sugar is all dissolved. Brush the loaves with the syrup as soon as they come out of the oven.